Lily of the Valley is grown for its delicate, white flowers and delicious scent. These lovely plants come up year after year and flower in May. Each plant is small; however, together they form a carpet of white, bell-shaped flowers in a sea of green foliage. They flower for around three weeks and add lovely late spring interest, especially to shady areas and under trees and shrubs. The flowers also attract bees with their scent. These plants are easy to care for; once planted they will come up every year with the first leaves appearing in late March or early April. This guide will show you how to plant these lovely delicate, scented flowers in your garden and what to do to keep them at their best. Most people enjoy the pure white flowers of the original Convallaria Majalis. However, there are a few other cultivars available. Rosea has flowers tinged with pink but is not as highly scented as Majalis. Buy Lily of the Valley Here! Some varieties grow larger than Majalis. These include Flore Pleno which can reach 30 cm tall and Fortin Giant which tops out at up to 45 cm. Dorien has larger flowers than Majalis. There are also several cultivars with variegated leaves including Albomarginata which has white edges and Albostriata which has white stripes. Aureovariegata, Hardwick Hall and Fernwood’s Golden Slipper all have attractive yellowish foliage. Lily of the valley can be bought in pots or root form. The roots have ‘pips’ on them. These are small swellings on the roots that are the growing tips of the plants. The roots can be hard to establish so for quick results choose potted varieties. Alternatively, plant the roots in pots to get them established before planting out. Garden centres and nurseries often sell the potted plants; however, you may have to look online for bare rooted Lily of the Valley. All parts of Lily of the Valley are poisonous when ingested and should be kept out of reach of children. Animals usually know not to touch them, but care should be taken with them just in case. Lily of the valley does have a tendency to spread when conditions suit them. If you have plenty of space this is often not a problem. 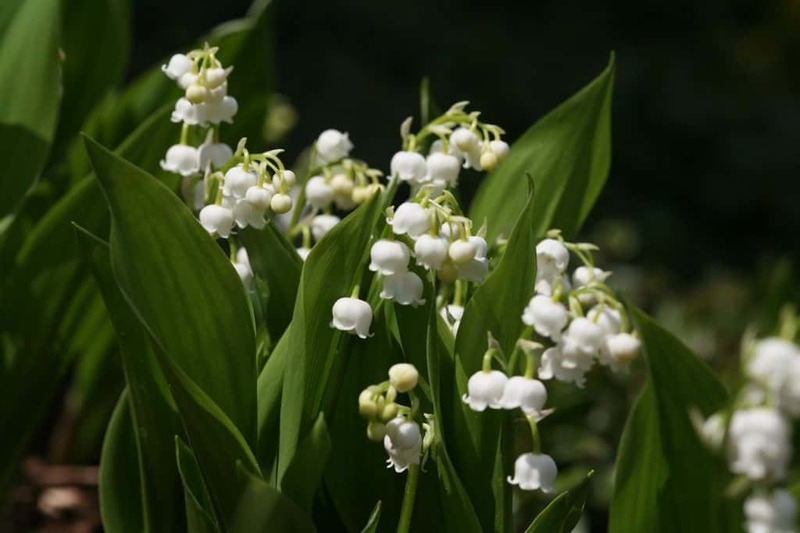 However, if you have a small garden and like it to be very neat and tidy, then Lily of the Valley may not be the plant for you. These moisture-loving plants do not like to be in full, hot sun. They will do best in part shade and especially appreciate being out of the sun throughout the hottest part of the day. Dappled light under trees or shrubs is ideal, but a position that gets sun only early in the morning or later in the evening would also be fine. These plants like to remain moist throughout their growing season and should not be allowed to dry out. If they do dry out, they are unlikely to recover. Lily of the valley will grow in any soil as long as it is neither bone dry or waterlogged. They are happy in loamy, sandy, chalky or clay soils. If planted in dry soils the will require regular watering. This plant does not require fertilizing in normal conditions. Usually, they do well just from the nutrients in the soil which is replenished by the fallen leaves of the trees and shrubs around them. If you do need to fertilize them avoid using a product high in nitrogen as this will encourage leafy growth rather than flowers. If they are planted near lawns, ensure that you don’t accidently splash them with lawn fertiliser as this is often high in nitrogen. Container grown plants will need some fertiliser. A handful of blood fish and bone applied in March and again in August will usually suffice. Ideally, find a position that is partly shady or receives dappled light and that remains moist most of the time. If the soil is poor add some well-rotted manure or soil improver. If the soil is not fully free draining, add plenty of horticultural grit before planting. You should wear gloves when handling these plants as they contain toxins that may irritate the skin. Plant Lily of the Valley when the soil is warm and conditions not too dry. The best times are mid-March to April or mid-September to October, but any time that conditions are moderate and when they can be kept moist will be fine. Dig a hole twice the width of the rootball and the same depth. You can sprinkle in some blood, fish and bone to get them off to a good start, however, in fertile soil, this is not absolutely necessary. For bare rooted plants, soak the plants in water for half and hour to an hour before planting and then position them in the hole so that the top of the roots are about half a centimetre below the soil surface. Do not plant them too deep or you risk them rotting. Backfill the hole carefully filling in all around the roots and ensuring there are no air pockets. Do not mound the soil too high over the roots. Water well until established and continue to keep them moist throughout the growing season. 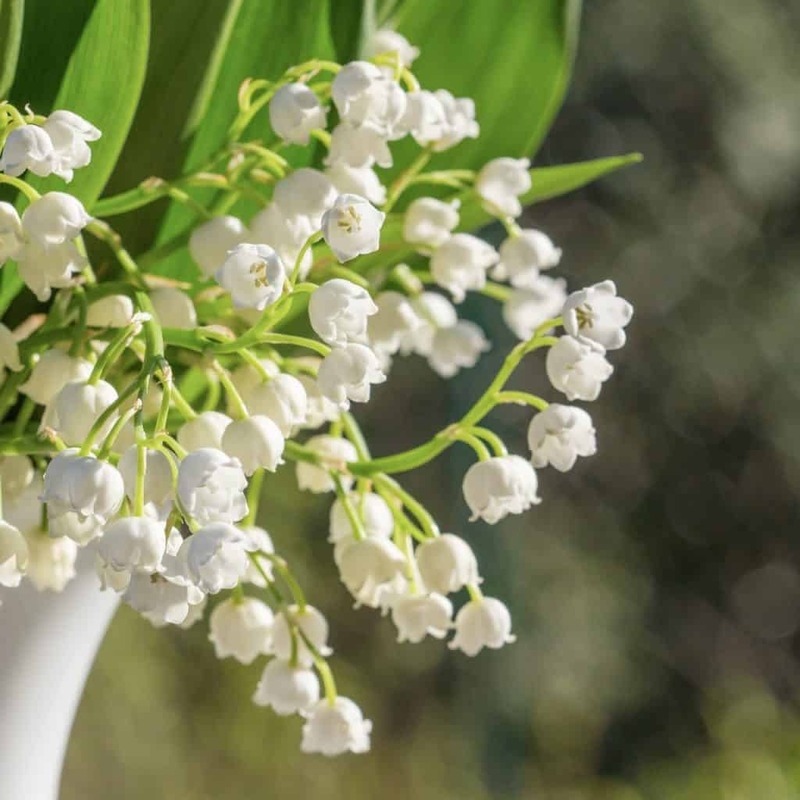 Lily of the Valley can be grown in a container, but care should be taken not to let the soil dry out. They have quite an extensive root system so choose a nice deep pot and ensure it has plenty of drainage holes. Remember to position your pot in a shady or partially shady place. Lily of the Valley requires little maintenance. Keeping them moist is the most important consideration. They often spread around the garden but are easy to remove when they appear in places they are not wanted. The leaves should not be removed when they are green. Yellowed leaves can be removed, or they can be left to die back naturally in autumn. If planted in a container they should be repotted once the roots fill the pot. Make sure the new pot has plenty of room for the roots but is not too large. Planting in pots that are too big for the plant can mean the soil stays wet for longer and this encourages roots to rot. This lovely spring flower looks good underplanting larger specimen shrubs and trees or in mixed borders and allowed to naturalise in dappled shade. The white flowers are a great plant to provide May blooms in a white garden. They are good plants to grow around doors and seating areas where their lovely scent can be enjoyed. Lily of the Valley is also a useful plant for groundcover in shady areas. They can be used as cut flowers but will only last a few days in a vase. Lily of the Valley does not require any pruning, however occasionally dividing the clumps can regenerate them. Lily of the valley will usually spread if they are planted in a suitable position. They look wonderful left to naturalize under trees or large shrubs and hedges. In addition, these plants can be propagated by divisions. In fact, dividing them occasionally can regenerate them if they have become congested. In autumn, carefully dig up your clump of plants taking care not to damage the roots. You can then separate the roots, ensuring that each new plant has some ‘pips’ (the swellings on the roots that are the tips of new growth). You can then replant these separately. Because Lily of the Valley is toxic they do not usually suffer from many pests. The exception is slugs and snails. Diseases that affect these plants include leaf spot and rust. You should protect your plants from slug and snail damage, especially when the first leaves emerge. Slug traps are an environmentally friendly way to protect your plant and are safe for use around children and pets. Containers of beer work extremely well. If you see dark brown or black spots on the leaves of your plant it may be affected by leaf spot. This is caused by humid conditions. To avoid this problem, try to water your plants at the base rather than on the leaves and do this early in the day so that moisture on the foliage has a chance to dry out before nightfall. It may also be worth dividing overcrowded patches of Lily of the Valley to allow more air to circulate. If your plant does succumb, remove all affected leaves. If the problem is severe you might need to consider moving your plants to a less damp area of the garden. Symptoms of rust include yellow spots on the upper surface of leaves and orange or brown spores on the undersides. Rust can stunt the growth of your plant, but it is rarely fatal. Remove affected leaves and clear up all plant material from beneath the plant. Also, water the plant at the roots rather than on the foliage. If you catch the disease early an application of neem oil can sometimes stop it in its tracks. Q I would like to grow Lily of the Valley because it is so pretty. However, I’ve heard that it is very invasive and can take over a garden. Is this true? It is true that in the right conditions Lily of the valley can spread. However, it will be unlikely to spread into areas that are hot and dry and so it should be fairly easy to keep it contained to shadier parts of the garden. If you are really worried about it taking over your garden you could grow the plants in a nice deep pot. Just remember to place the pot in a shady or semi shady spot and keep it moist at all times. Q I have had a lovely swathe of Lily of the Valley growing under a tree in my garden for years. However, recently, there have not been so many flowers. What could be causing this? It sounds like your Lily of the Valley has become congested. You might like to try digging up the most congested clumps and dividing them. You can then replant the healthiest roots. An application of blood, fish and bone added to the soil before replanting may also help. Q I have inherited a garden that is covered with Lily of the valley. I love this plant; however, I don’t want it everywhere. How do I get rid of it? You can dig this plant up as its roots are not too deep. You will have to sift out every scrap of root, though to ensure the plant does not come back. After digging it up you should cover the area for six months if possible to prevent new plants from growing. As a last resort, you could use a product containing glyphosate. Bear in mind that this will kill any plant it comes into contact with and not just Lily of the Valley.